Walking into the woods under the towering trees, away from roadway noise and listening to the quiet is like being in an open-air cathedral. But there were still more of nature’s beauties ahead of us yet to be experienced in the Pacific Northwest. Now here’s a bit of trivia for you. On Oregon’s highways, every time you cross the 45th parallel, a state-sponsored sign informs you that you are exactly halfway between the North Pole and the equator. We were driving east from Portland on Interstate 84 toward our hotel in Hood River, Ore., which is billed as the “Windsurfing Capital of the World.” About 20 miles east of Portland is the exit for Historic Route 30. 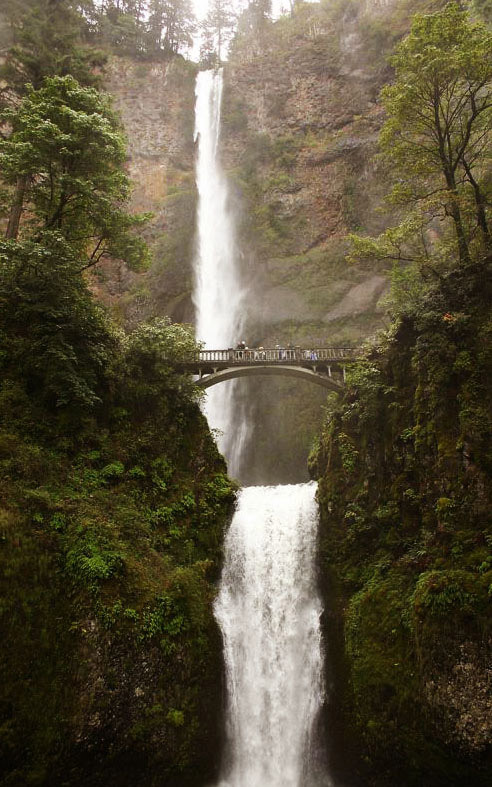 Take this little detour if you are not in a hurry to get to your next destination and enter the world of Oregon’s rain forest and waterfalls. On the north side of Historic Route 30 is the majestic Columbia River, with views of Washington on the opposite bank. To your right are the waterfalls, seven of them, one after another, over a distance of about eight miles. Individually, any of these waterfalls would be a major scenic and tourist attraction. Here they vie for attention. As you carefully navigate the turns on the two-lane road through the rain forest, many waterfalls are visible from your vehicle. Others require short hikes to visit. And then you reach the fifth waterfall in line, the pièce de résistance…Multnomah Falls. At 620 feet, it is the tallest waterfall in Oregon and second-tallest year-round waterfall in the United States. At the Multnomah Falls visitor center, the only building on this stretch of road, is a restaurant, souvenir shop (of course) and restrooms. This is a ‘must’ stop for pictures. Back on the Interstate, our next stop was just down the road at the Bonneville Dam complex. If you think dams are alike and differ only in size, you are mistaken. The Bonneville Dam visitor center’s educational displays describing the dam’s features are extensive, but there is something special here, a complex system of fish ladders for salmon and other species moving up and down the river. A viewing area with large underwater windows gives visitors the opportunity to actually see fish migrating, and it’s all free. Continuing our way east, we are blessed with a tantalizing glimpse of the snow-covered 11,235-foot Mount Hood. Then the clouds descended. It was to be our only view of this majestic mountain during our three days in the Hood River area. Arriving in Hood River, we checked into the small, elegant Columbia Gorge Hotel and Spa situated on a bluff overlooking the Columbia River. It was built in 1921 atop a 208-foot waterfall named Wah Gwin Gwin (Native American, meaning rushing waters). The waterfall was described in the Lewis & Clark journal. The Columbia Gorge Hotel has undergone many changes over the years, but one thing has never changed: the sweeping views of the majestic Columbia River and the mountains of Washington, visible from many of its 39 rooms and suites. It has been a favorite of movie stars since the days of silent movies. Hollywood heartthrobs such as Rudolph Valentino, for whom the lounge was named, and Clara Bow were frequent guests. Then there was Shirley Temple, Burt Reynolds, Olivia Newton-John, Anthony Quinn, Tom Cruise and many other notables, including Presidents Taft, Coolidge and Roosevelt (Teddy). On our arrival, we were greeted by Paul Robinson, general manager and head chef, an unusual combination. Paul quickly displayed his abilities in both areas during our stay, but no more so than when we dined in the hotel’s signature restaurant, Simon’s Cliff House. For dinner he prepared halibut stuffed with Dungeness crab over a bed of curried raisin rice and zucchini flowers stuffed with cheese, fried tempura style. The hotel’s restaurant prides itself in serving only the freshest of local foods and the best of the local wines. Paul Robinson has lived onsite for the past four years as a hands-on manager overseeing daily operations. He is largely responsible for bringing new life back to a classy old lady. This is a low-key hotel. Guests have an opportunity to recharge their batteries. It’s all about the views and atmosphere. There are no golf courses, riding stables or large exercise facilities. There is a spa on premises. Walking the beautifully landscaped grounds, enjoying the scenery, having an afternoon cocktail on the outdoor patio and enjoying the excellent food are what a stay at the Columbia Gorge Hotel and Spa is all about. Weekends, there is music in the lounge. The hotel is a magnet for weddings, and things can get lively during those times. However, if you want activity, downtown Hood River is close by. It’s a city of young people with coffee and art shops, restaurants and outdoor outfitters. Trips can be booked for windsurfing, kite boarding, Hobie Cats and kayaks, Mount Hood railway tours, Mount Hood air tours from the local airport, where there is also an impressive air museum. Skiing and snowboarding are available year-round on Mount Hood. The abundance and variety of game fish in local waters make this an angler’s paradise. When you visit the Columbia Gorge Hotel and Spa, be sure to ask for Paul and have him show you the photo of the hotel’s ghost captured on film in the background during a wedding rehearsal. I have a copy, but it won’t reproduce well in the paper. The photo is amazing. This was the last stop on our 2013 USA road tour. It was 3,200 miles back home to West Palm Beach by the shortest route. Leaving the “Land of Waterfalls,” we traveled east and were soon driving through Oregon’s high desert. It is truly an amazing and diverse state when you can go from rain forest to waterfalls to high desert in about an hour. An Oregon law, strange to outsiders, prohibits drivers from pumping their own gas. It must be done by an attendant, who might even offer to clean your windshield. I believe the only other state that has this law is New Jersey. Oregon also has no sales tax, making many purchases a relative bargain. A quick glance at the car’s odometer when we pulled into our driveway showed we had covered almost 10,000 miles in two months. Eliminating major city traffic from the equation, most driving was done on almost traffic-free set-the-cruise-control-and-forget-it highways. The sights and experiences were wonderful, and we took almost 3,000 photos. Isn’t digital wonderful? The USA is a large, diverse and beautiful country. If you have been putting off your trip for “someday,” picture a billboard we passed on I-80 somewhere in the middle of Nebraska that said, in bold letters, “SOMEDAY IS TODAY.” I didn’t get a chance to read the words below the headline but don’t think it was a religiously based message. It got me thinking.